Sharing Lives is a company that is set up to help Christians in Europe to share their lives with their Muslim neighbors. We provide training and coaching to churches, Christian organizations and individual Christians. Throughout Europe we find Christian communities and Muslim communities living in close proximity to each other. 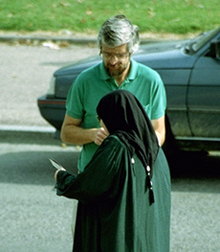 Individuals passing each other in the streets, standing next to each other waiting for the bus, sharing apartment buildings, classrooms and business canteens, but essentially strangers to each other. What is it that hinders Christians from sharing their lives with Muslims? One doesn’t have to fly across the world to meet Muslims, but just have to cross the street, but what keeps many from doing so? Is it lack of information? It does not seem like it. There are plenty of good books on Islam and at many Christians schools and churches across Europe one can learn about Islam as I could. But often this doesn’t result in more friendships between Christian and Muslims. Meanwhile, Islam is “hot” in today’s media. Many Christians talk about the Muslims who burn churches in Indonesia, persecute Christians in Egypt, fly airplanes into buildings, and hijack people in Yemen. For a long time these events occurred far away. But then trains where bombed by Muslims in Madrid and in the London underground, and a Dutch television producer was killed by a Moroccan in Amsterdam. Also it is observed that many Muslims seem reluctant to adapt to “Christian” European rights, claiming their own rights instead. The average European Christian is afraid of Muslims, and fear is the single biggest factor preventing them from relating to Muslims. On this website you’ll find resources to help Christians in Europe overcome their negative attitude of fear for Islam and Muslims and learn to respond with grace and share their lives with Muslims.